The Lyndon Engineering development team are finalising the design for their viticulture soil improvement system after many months of market research. Field trials begin in late May for the machine known as the ‘Terroir 180’ which will improve a vineyards and general horticultural soil structure. 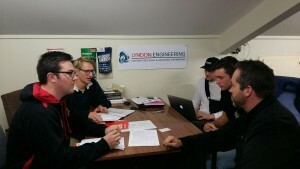 The project team includes four 4th year University of Canterbury Engineering professionals, along with Elton Hyde and Richard Butler from Lyndon Engineering. The development project involves a range of engineering disciplines including steel fabrication, pneumatics, electronics, hydraulics and flow control. If you would be interested in your vineyard to be part of our trial process in the Spring of 2017 please contact Elton Hyde at elton@lyndonengineering.co.nz or call us on +64 3 3478516. If you have a soil depth of at least 300mm then our trials will be suited to your environment.